This afternoon at Stadio Ennio Tardini, Parma Calcio 1913 continued their march in first place of Girone D of Serie D, thanks their narrow victory over Romagna Centro (1-0, box score of the game below). Today’s success, along with the home draw yesterday by Altovicentino against Legnago, allowed Parma to extend its lead atop the table. At first a bit of messy, head coach Luigi Apolloni’s boys recovered to play much cleaner game. The lineup that allowed them to collect three more precious points was put together just ten minutes into the second half. In the 56th minute, Yves Baraye (leading goal-scorer for Parma Calcio 1913 with seven goals) scored under the Curva Nord of our fans, depositing a perfect ball from Mousa Balla Sowe past the opposition’s goal line. Sowe was the protagonist, in this occasion, of a remarkable recovery, and had good instincts that favored his fellow teammate. 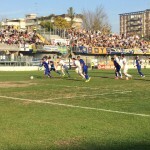 PARMA CALCIO 1913: Zommers, Messina, Saporetti (34′ Agrifogli), Corapi, Cacioli (V.Cap. ), Lucarelli (Cap. ), Lauria, Giorgino (46′ Rodriguez), Longobardi, Baraye, Sowe (59′ Musetti). All. : Apolloni. A disposizione: Fall, Adorni, Benassi, Ricci, Guazzo, Melandri. ROMAGNA CENTRO: Bissi, Arrigoni, Gregorio, Dall’Ara (Cap. ), Ronchi, Morena (60′ Ridolfi), Tola (V.Cap. )(70′ Luzzi), Ferretti, Spadaro, Tonelli, Rizzitelli (60′ Brunetti). All. : Rossi. A disposizione: Zollo, Brunetti, Maioli, Vitellaro, Gori, Cenci, Luzzi, Tamburini, Ridolfi. Grisei of Macerata and Michele Redaelli of Pesaro. Notes – Corner Kicks: 11-2. Yellow Cards: Morena (19′), Cacioli (24′), Messina (39′), Longobardi (54′), Zommers (77′), Gregorio (84′), Rodriguez (91′). Stoppage Time: 2’ first half, 3’ second half. Attendance: 10,682 (10,089 abbonati, 593 at the door) for a total of 38.536,32 Euro.